Following the cessation of regular trading this afternoon, IBM reported its first-quarter financial performance. The company reported higher-than-expected adjusted profit on a per-share basis of $2.91, but the company’s $19.59 billion in period-revenue was under street expectations of $19.64 billion. The company now has a run of 12 straight quarters of declining revenue. IBM’s situation requires some context, as it adjusts when reasonable for currency strength changes, and also for its recently divested businesses. Using constant currency from the year-ago quarter, and also adjusting for the company’s now slimmer size, IBM had flat year-over-year revenues. 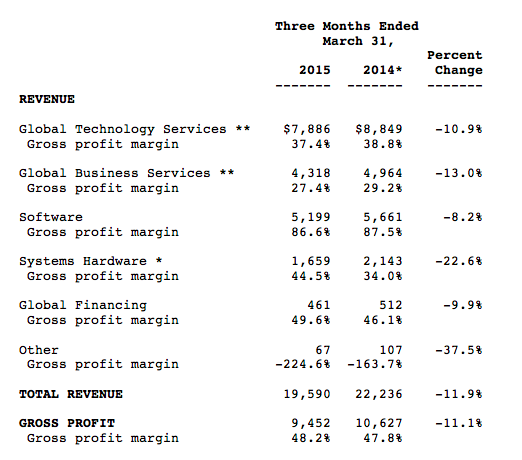 It’s worth remembering that IBM missed on revenue by a slim margin. As such, those declines are less sharp than they appear, and they are very nearly in-line with expectations. IBM, in some ways like Microsoft, is managing a transition toward the cloud and shifting away from its legacy business models, meaning it must reinvent revenue sources and retire others in the new technology economy. It is finding the transition somewhat rocky. The company ended its fiscal first quarter with $8.8 billion in cash and equivalents. IBM is well capitalized, its cash hoard growing from $8.5 billion in the sequentially preceding quarter. The company’s cash position, however, is down by $900 million from the year-ago quarter. IBM is all but flat in after-hours trading, following a strongly up day in regular trading. The company is currently worth north of $160 billion.